Let me start this review by saying that I absolutely love the idea behind Silverback Games’ Aurora – Puzzle Adventure. I even love the puzzle design — most of the time. It’s creative, clever, and sometimes downright tricky. It’s because I like the puzzles so much that I put up with a lot that I didn’t like in order to enjoy them. There are so many things in Aurora that unnecessarily waste the player’s time. There’s too much forced between the player and the puzzles. So I thought I would take this opportunity to break down what I liked and didn’t like and how it could have been improved, using some of my favorite puzzlers for comparison. First off, let me explain the game a bit. It’s a 3D match-three puzzler that uses perspective as its main mechanic, similar to what you’ve seen in the wonderful Monument Valley. But it uses perspective in a very different way, so there really isn’t that much else the games have in common. 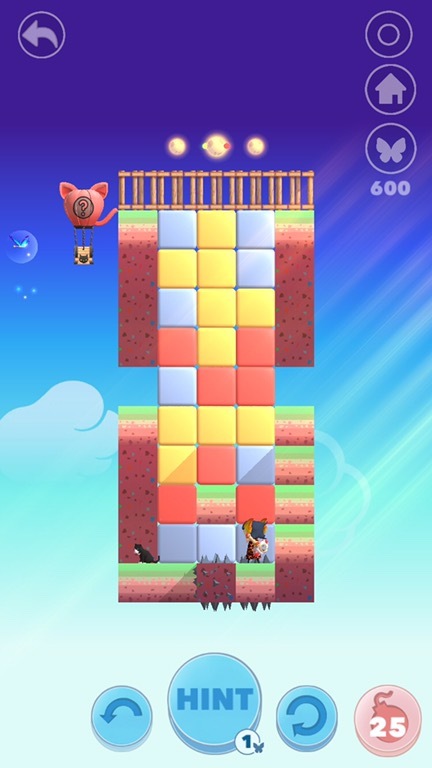 The game consists of over 250 levels. 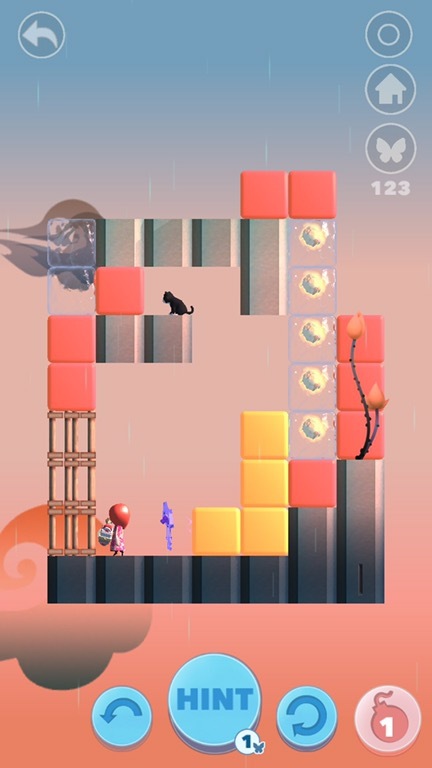 Each level is a 3D board that you rotate to see from four sides as well as from above. The board itself is made up of blocks, and then there are all sorts of colored cubes that can be tapped to clear as long as they’re in a group of three or more of the same color. Perspective plays a huge part in this, as the cubes don’t have to actually be next to each other in order to clear them — you just need to be able to see them that way from one of the five angles. The goal in each level is to clear a path from a little girl named Aurora to her pet cat, and then she’ll automatically run to it. As a fan of match-three games, relaxed puzzlers, perspective games and, of course, cats, there’s a lot here for me to like. Sometimes, instead of clearing the whole board, you need to leave some cubes on there for Aurora to step on. This adds another level of complexity. And then there are orbs you can collect, called moons. I’ll talk more about them later, but they often are given as a reward for figuring out a special path around the board or clearing all cubes even when it’s not necessary. Things get even more complicated as you add in spiked cubes and adaptive cubes that change to the color of the cube next them. Then there are magma cubes that harden when combined with a water cube. Aurora can also swim through water, making it possible to create paths that go directly upward. And finally, there are little machines that you can press in order to push another block over one space. If these are on rotating blocks then the possibilities are practically endless. With over 250 levels, the developers have had plenty of room to experiment, and there are a lot of clever puzzles. Near the end, they started to get overly complex and I used hints a lot more than I would like. But I can definitely say you get your money’s worth here. There is a lot of content, and most of it really solid. It would be an easy recommendation to puzzle fans if not for all the little things that get in between the player and the puzzles. So let’s start talking about that. First, I want to talk about the camera because it directly affects the puzzles themselves. As I mentioned, you swipe or drag to screen to rotate the board and see it from a different angle. For the most part, especially early on, this works fine. But later on, the board is sometimes set up so it’s hard to see what kind of path you’re supposed to build for Aurora. Look at the video below for an example. It’s not the strongest example, but in it you can see that the cat is hidden from view unless you look at a diagonal. But the camera doesn’t let you because it snaps into one of the sides even while you’re still holding onto the screen and trying to see inside. It’s an even bigger issue in desert levels where pieces of the board all blend together. Unlike Monument Valley, Aurora can’t walk on impossible structures, so it’s imperative that she has a clear path that is structurally sound. I had similar issues with Mekorama early on, but the developer added a camera with more flexibility. It seems like something that should be easily solved if the game would just give the player the control to rotate as much as they want and only snap into place when their finger is lifted off the screen. Hopefully that can be implemented in the future to offer a more user-friendly experience. My other complaints are less related to the gameplay itself and more to all the extra stuff thrown in. The game will waste a lot of your time. You need to watch an un-skippable animation of Aurora running to her cat after every single level. Depending on the length of the path, this could take as much as ten or fifteen seconds just for that part. It’s cute at first, but I really didn’t need to watch it hundreds of times. This could have easily been remedied by allowing a single tap to skip the animation. But that’s not all! If there are moons to pick up, you’ll have to watch an animation of them circling a giant heart. Every single time. There’s no way to skip that either. But wait — there’s more! Most levels have a chest that you open at the end. So it’s a few more taps and a few more seconds between you and the next puzzle. But what makes this so infuriating for me is that the chests are not exciting. Early on, you find costumes in some of them. But once you have them all, you’ll only see butterflies — which are used for hints — and bombs — which are used to skip a level entirely — inside the chests. Those are the only things you will see for nearly two hundred levels. Add all these things up, and you get around twenty to thirty seconds of waiting between completing one puzzle and starting the next. I did the math and it comes out to about 125 minutes, or over two hours of time spent just watching unnecessary animations. But I still want to talk about each of these things individually. Let’s start with the moons, which I keep calling orbs. Early on in the game, they power a hammer, which is used to break the ice covering certain levels. If you don’t have enough orbs, you won’t be able to continue to that next level. But this was such a redundant feature, since you already have to play the game in order, one level at a time. You can’t skip without a bomb. 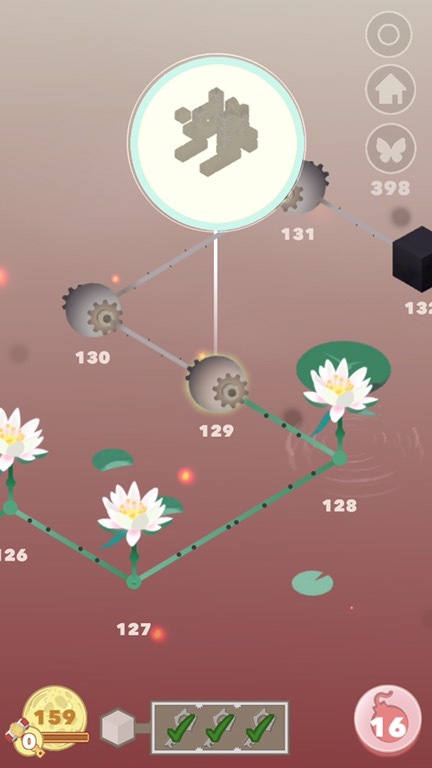 There are some levels that can be completed without picking up the moons, and others that give you bonus moons if you solve the puzzle a certain way. But even so, I think it would be pretty hard not to pick up enough moons. And, just like the costumes, you won’t need the hammer past level 100. After that, the moons just get added to a counter in the lower left corner that serves no purpose. It doesn’t tell you how many moons you’re missing so you can go back for them later. Those you have to track yourself by looking for the orbiting moon on the map. Now, I’m fine with the moons as part of the puzzles. They add some extra challenge, and more often than not I took the extra time and effort to get all the moons. But the hammer aspect felt tacked on as just another time-waster. Did the developers feel that the game needed more gimmicks for some reason? I don’t know, but I found it wholly unnecessary and it just put one more thing between me and the puzzles. Similarly, you earn keys early on in the game — once again, not past level 100. Three keys open up a door to a new area. The keys are yet another unnecessary gimmick that waste time and are only part of the game early on, leaving an ugly icon on the bottom of the screen for the rest of the game for absolutely no reason whatsoever. And then there’s the butterflies. These are traded in for hints. I do appreciate that the developers included such a comprehensive hint system. If you tap the hint button, a butterfly lands on the cube you’re supposed to tap. If you have enough butterflies, you can essentially have the game lead you every step of the way. After level 200 I actually did this with some because I was losing patience. But anyway, the hint system works well. I just wish they could have handled other aspects of it better. For instance, I collected over seven hundred butterflies throughout my time with the game. That’s a lot of chests to open. And if you repeat levels that have chests, you’ll get another chest each time. I ended up with a lot of extras just by trying to get the bonus moons by clearing out all the cubes for certain levels. There are also levels that require you to pick up all the ghost moons in one run to get some bonus moons. If you only pick up some of them, it doesn’t count. So you need to plan out the perfect route. If you accidentally solve the puzzle without getting the bonus moons, you get another chest and can try again. So the hints are essentially infinite if you just find an easy level that gives a chest and keep solving it over and over. 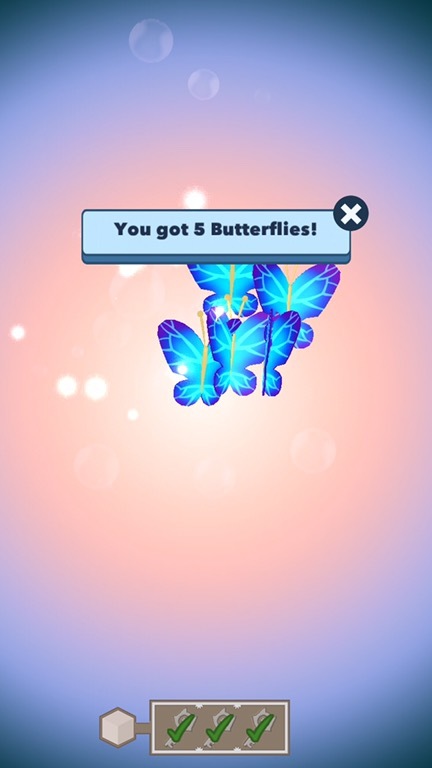 Considering all this, why couldn’t the game just give unlimited hints and not waste the players’ time opening chests for butterflies — as pretty as they are? And the same with bombs — just let players skip five levels ahead and leave the bombs out altogether. Blowing up a level just because you’re stuck seems like an overreaction anyway. And while we’re discussing hints, let me talk about the user interface, including the hint button. Look at the screenshot below. It’s very cluttered, with the hint button being the biggest one on the screen. It also pulsates sometimes to get your attention. 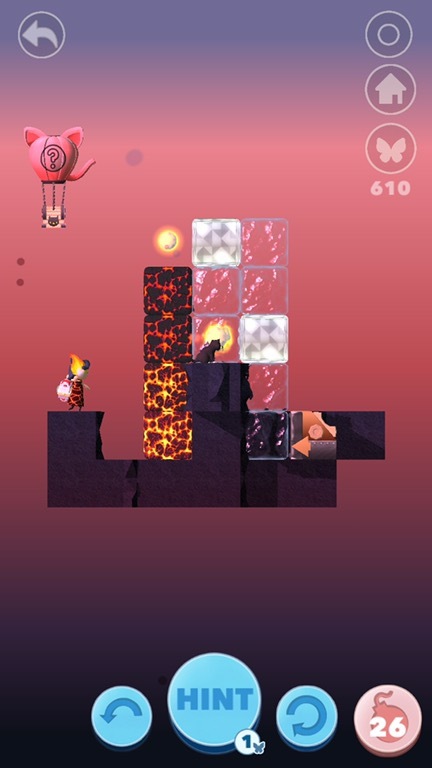 Then, the undo and reset buttons are sandwiched between the hint and bomb buttons, making it very likely that you will sometimes use a hint or explode the level by accident. This has to be one of the messiest non-free-to-play interfaces I’ve seen. It seems to be pushing you to use hints instead of solving the puzzles on your own, and I have no doubt that it caused me to use a lot more hints than I normally would in a puzzle game. And to make things messier, there are other buttons on the upper right — one for recording and one for changing your costume. I don’t see why the hint, bomb, record and costume buttons couldn’t all be under a single pause menu instead, reducing four buttons to one. This would keep the screen cleaner and also put less pressure on the player to use hints. 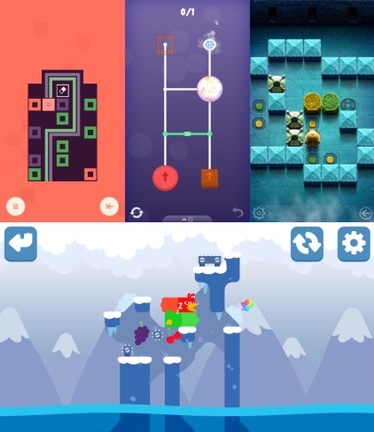 For example, look at the clean interface of Twisted Lines, Puzzlepops!, Go to Gold 2, and Snakebird. They all have an undo button and a reset button. That’s all that’s on the screen. Anything else is accessed through the pause menu, keeping the puzzle screen clutter-free. In all four of those games, I could trust my finger to land on the right buttons without paying attention to them. But with Aurora, I have to make conscious effort every single time not to press the huge hint button or “skip” button that they’re sandwiched between. It’s just not a user-friendly interface. And Twisted Lines also sells hints, but they’re in the pause menu and never in your face. I knew they were there if I needed them, but they’re out of sight and out of mind until I get so desperate I go looking for it. Because of that, I never used a single free hint, even when I was struggling with a level for hours. While I am grateful for the unlimited undo button that is so rare to find on the App Store, the reset button could use a bit of work. Here’s the problem. Remember I was complaining about the game wasting my time? Well, pressing the reset button in Aurora slowly rewinds each of your moves. You have to sit through each of them, even if there were a hundred of them (it’s possible!). You can see it in action in the video below. The only option besides waiting is to instead leave the level and go back to it from the map. But that’s a clumsy patch for it. In three of the games mentioned above, the reset button instantly resets the board. No waiting, no nonsense. Twisted Lines is just a bit different in that you hold down the undo button until everything rewinds. But it’s quick and snappy and never felt like a waste of my time. Instead, I was impressed that they managed to combine the two buttons, creating an even cleaner interface. Sometimes, simpler is better. Don’t overcomplicate things. In Aurora, it’s certainly overcomplicated. Let me reiterate that there is a really solid puzzle game here with clever mechanics and graphics that are easy on the eyes. Stripped down to just the puzzles themselves, it is a fantastic game. Unfortunately, it’s not stripped down enough and is cluttered with all sorts of unnecessary nonsense. I’m sure there are players who won’t mind these things, and some who may even love them. And those who don’t like them might eventually get numb to all the time-wasters, like I did, but that doesn’t change the fact that you’re sinking hours of cumulated seconds into things that separate you from the puzzles themselves. I hope this long review didn’t come off as too much of a rant. I just wanted to use this game as a great example of going overboard with no real reason. To me, it seems that the developers saw that so many free-to-play games have chests and rewards and nonstop nonsense, so they thought it was necessary to include them. Just because other games have these “prizes” doesn’t mean every game has to have them. Then again, it’s also possible I’m just not the intended audience, and they were going for the people who are used to having their time wasted with silliness. But for me, I prefer a puzzle game to be distilled to its basics, to cut out all the fat and just leave me with the tasty meat. In short, I wish the developers would just let their players play the game! Each of these things I listed alone might not be so bad on their own, but compounded on top of each other, I found myself cursing at the game far too often. So it’s hard for me to recommend the game without caveats. I think I’ve given enough information here to help you decide if it’s something you would enjoy and have the patience for. If so, you can download Aurora – Puzzle Adventure here. If not, hopefully some of these issues can be resolved to make it easier to recommend to those who value their time. Hi, I am stuck in “The Room 3”, I’ve done the 1st ending (train), and have continued on, but when I go to the poster book The Great Khan, it’s closed,, and it’s supposed be open for me to get the box. Help, I love this game and want keep playing? Glad to hear! 🙂 If you already have Aurora, give it a chance. But it definitely could use some work to make it a must-have.